RAM Industries is now stocking a Single-Acting with Double-Acting Assist Mast Raising Telescopic Cylinder to accommodate the needs of the Oil & Gas industry. 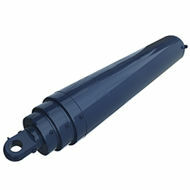 This 60" retracted model with a pressure rating of 2500 psi is interchangeable with accepted current market mast raising hydraulic cylinders. They are available for quick shipping turnaround – which is important to an industry where time matters. 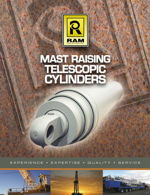 RAM also offers custom designed and manufactured Mast Raising cylinders which will fit your exact requirement. Fully customizable with options like single or double acting, various stage sizes and quantities, pilot operated check valves, counterbalance valves and unlimited types of mountings. Please contact our RAM team to discuss your specific requirements.